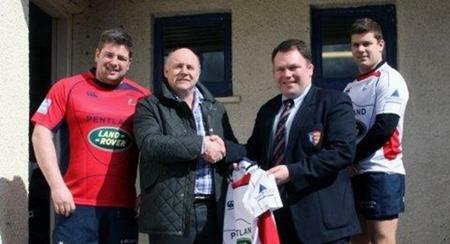 HADDINGTON Rugby Football Club president, Andrew Cunningham, took the opportunity at the recent Haddington Sevens tournament to present a first team shirt to Rod Cook, an associate at Shepherd Chartered Surveyors’ Musselburgh office, as recognition of the support provided to the club from the surveyors over recent seasons. Shepherd’s Musselburgh office has had an association with the club for some years now, having previously lent its support to a team training shirt, but this season has seen the club’s first team strip feature the distinctive blue triangle logo of Shepherd on its sleeve for the first time. Rod Cook said: “We are delighted with our involvement with Haddington Rugby Football Club and its excellent community connections, which include a thriving mini section. With a team of dedicated chartered surveyors specialising in the inspection of residential properties, Shepherd is recognised nationally as a dominant force in the Home Report market. Its Musselburgh office opened in 1998 and is located at 25 Bridge Street. Photo caption: (left to right): Graham Paris, club captain (Red Strip), club president Andrew Cunningham, Roderick Cook, associate at Shepherd Chartered Surveyors, and Nick Bell (player in white strip).